Dice Games for Kids - Are you using a math workshop format this year? Are you looking for games your students can complete independently while you work with small groups? 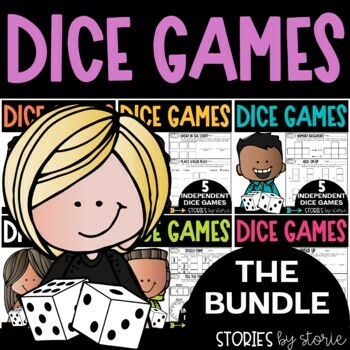 Here is a bundled pack of 17 dice games that students can use independently during math workshop. I print my dice game boards onto cardstock paper and place inside of sheet protectors. Students use dry erase markers so the boards can be used over and over all year long. These dice games come in both color and black & white versions. Some of the dice games also include sample game boards. NOTE - This game is found EXCLUSIVELY in this bundle. NOTE - This game is a FREEBIE in my store and you can find it here. • Order Up - students create 2-digit numbers and put them in numerical order (Two versions included: largest to smallest and smallest to largest). • Double the Fun - students roll one die, double the number, and cover it on their game board. 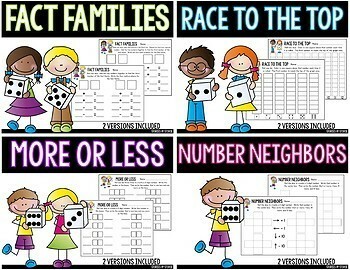 • Fact Families - students use dice to practice identifying fact family number sentences (2 versions included). • Race to the Top - students will roll a die and record the results on a graph. (2 versions included). • More or Less - students will roll the dice to create a 2-digit or 3-digit number. Then students will identify the number that is one more and one less. • Number Neighbors - there are two versions of this game (2-digit and 3-digit). Students roll the dice and place the number created in the center box. Then students identify the numbers that are 1 more, 1 less, 10 more, and 10 less. 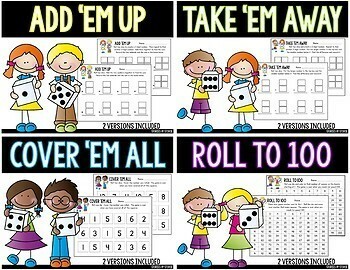 • Add 'Em Up - Students roll two dice and add the numbers together. (Two versions included: 1-digit and 2-digit). • Take 'Em Away - Students roll two dice (placing the larger number on top) and find the difference between the two numbers. (Two versions included: 1-digit and 2-digit). • Order In the Court - students will roll 3 or 4 dice. Then students will rearrange the numbers to create the largest and smallest number possible (two versions of this game). • Roll and Compare - students will roll the dice to create 2-digit and 3-digit numbers. Students will then use >, <, or = symbols to compare the two numbers (two versions of this game). • Place Value Play - students will roll the dice to create 2-digit or 3-digit numbers. When working with 2-digit numbers, students will identify the numbers that are 1 more, 1 less, 10 more, and 10 less than the number rolled. With the 3-digit numbers, students will also find the numbers that are 100 more and 100 less than the number rolled (two versions of this game). • Odds vs. Evens - students will roll the dice and find the sum of the two numbers. Students will then graph whether the sum is odd or even. • Pocket Change - students will roll a die to determine the number of each coin in their pocket. Students will then determine the value of each set of coins as well as the total amount of change in their pocket (three versions of this game). Note - the multiplication and division games are NOT included in this bundle.